Haifa, Israel, April 6, 2011 - Elbit Systems Ltd. (NASDAQ and TASE: ESLT) ("Elbit Systems") announced today that it was awarded a contract to supply self-propelled artillery and accompanying systems to an African country. The contract, valued at approximately $24 million, will be performed over the next two years. This is the first contract announcement regarding Soltam Systems Ltd. ("Soltam") since its recent acquisition by Elbit Systems. The contract calls for the supply of a complete solution, including Soltam's ATMOS self-propelled artillery, command stations, observation and target acquisition systems, as well as fire control and command and control systems. In addition, Elbit Systems will manage the training and maintenance during the project's duration. Bezalel Machlis, Elbit Systems' Executive Vice President and General Manager – Land and C4I Division, commented: "This new contract highlights the high synergetic value within our various land activities, allowing us to provide our customers with complete unique solutions, from artillery platforms, to target acquisition systems, through to advanced command and control solutions that connect all of the systems". 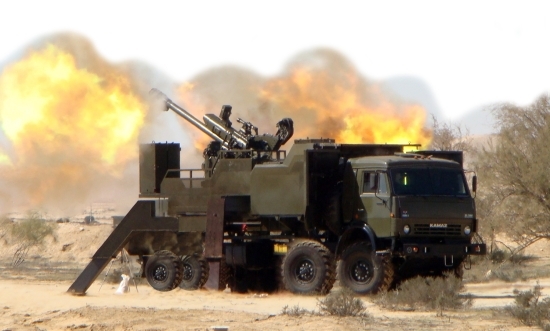 Machlis added: "Our integrative solution, combining Soltam's artillery systems and our range of advanced electronic capabilities, provides a cutting-edge operational solution suitable for the growing trend of a transition to wheeled mobile platforms for artillery".